Automatically counts and places day olds in chick boxes. With minimal surface and the automatic selection of different chick sizes, Pas Reform’s chick counting and boxing system delivers ‘friendly’ chick handling, minimising stress and reducing travel time to the chick boxes for both small and large hatcheries. Chicks are counted as they pass an infrared counting head - quickly and efficiently counting up to 30,000 chicks per hour. Capacity can be doubled to 60,000 day old chicks/hour by placing a second unit in parallel. The system is accurate to within two chicks per thousand, with counting controlled by a micro-processor. A control panel display shows the number of chicks per box and the total number of chicks counted. The number of chicks per box or compartment is adjustable. The sensor is easily removed for easy cleaning. The handling of one day olds is of great importance to hatchery customers, as rough handling can adversely affect chick quality. For this reason, the speed of the belt and drop height into the chick boxes is reduced to an absolute minimum to minimise stress. 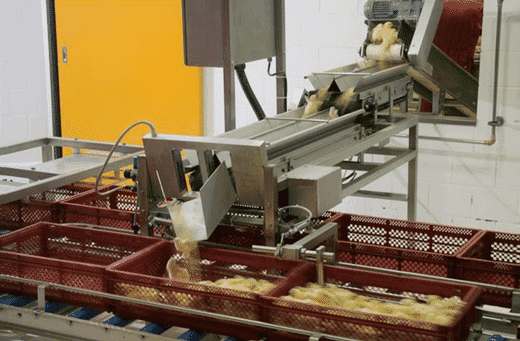 Various options can be added to the system, including a stacker for filled chick boxes, a de-stacker for empty chick boxes, a separator, a chick take-off system and waste treatment equipment. Automatic spray vaccination equipment can be added to the discharge point of the chick counter, to vaccinate the day olds against infectious bronchitis and/or Newcastle disease. Box transport CC-12 The boxing system is designed for one man operation and includes roller conveyors for box transport (two per one chick counter). Filled boxes are pneumatically pushed from the supply box conveyor into the take off box conveyor.